Dec. 23, 2012–The New York attorney general has jurisdiction over charities that (1) raise or spend more than $25,000 in New York, and (2) any charity that uses a professional fundraiser. In 78 percent, or 467, of the 602 campaigns, the charities kept less than 50 percent of the funds raised. In 76 of the 602 campaigns reflected in the report, charities actually lost money. In only 49 of the 602 campaigns did the charity retain at least 65 percent of the money raised, the amount deemed acceptable under the Better Business Bureauʹs standards for charitable organizations. NYC | Landfill Idea a Mistake? I have heard it several places - the map of part of Manhattan that was not flooded by Sandy looks a lot like the Manhattan Island that Peter Stuyvesant et al. colonized. The implication is that the landfill approach was a mistake. So the World Trade Center was taken down from above by terrorists and its landfill has been overrun by Sandy's surge. The two disasters are often linked but not quite in this way. Elliott wrote on 12/13/12 at 4:45 PM The Dutch are already building houses that float and are attached to the ground (the seabed-to-be) by anchors. We have a LOT more land here, and can afford to let large amounts of it revert to its natural state. We'd better start building reefs for oyster beds and planting marsh plants in low-lying areas of New York now rather than waiting for another Sandy, because there will be, not one, but many. Like it or not, New York is going to return to the boundaries it had in the 1600s, pre-landfill, no point in spending a lot of money and labor trying to deny it. Read more: http://bit.ly/1Or8kCV (limited access). One reason that the Dutch were over here in the first place is that floods had been taking place in Holland and Belgium and they were looking for places to relocate their people. Presenting Certificates to graduates of a course on brownfields remediation by the NJISJ. L to R: Albert Williams, Director, Workforce Development and Training, NJISJ; Cornell William Brooks, President and CEO, NJISJ; a student; Schenine Mitchell from EPA Region 2; and five other students. Photos by JTMarlin. A major front-page story in The New York Times today (Thursday) questions the value-for-money of $29 million spent on a halfway-house program for ex-offenders in Brooklyn, on the basis that it fails to deliver on promises of job training and life skills support. On Tuesday, December 11, I attended a graduation ceremony for 14 young people who went through a program that impressed me as delivering on exactly these promises. The course was offered by the New Jersey Institute for Social Justice in Newark, N.J. The graduation ceremony included 30 people (of all ages) from the families of the students and a dozen people involved in the program, which has corporate as well as government support. The students were graduating from the Metro Newark Brownfields Training Program, which offers a combination of life skills, academic and highly technical training for careers in remedying brownfields – i.e., land and buildings declared toxic and unfit for habitation. The students enrolled in 14 weeks of EPA-specified training for lead abatement, asbestos removal, OSHA health and safety, hazardous waste operations and emergency response and general brownfields issues. The program is offered by the New Jersey Institute for Social Justice, which offers both training and advocacy for ex-offenders. This was the first graduation I attended, as an observer, because I have a six-month contract to assist the Institute with advocacy and with analysis of job-market data, and I was interested in this other part of the Institute's work, which I observed taking place at the other end of the office floor. Like a good shepherd, the Institute's Director of the Workforce Development and Training, Albert Williams, knows each one of his flock. At the graduation ceremony in the New Jersey Historical Society in Newark, he good-naturedly described each of the trainees, from the super-eager one who arrived an hour early each day of class to the one who was a Doubting Thomas, disbelieving in the possibility that a job would await him at the end of the program. Studies of training programs have turned up widespread evidence of low placement rates. But the brownfields training program has been a huge success by this criterion, with the enrollment of 33 men and women and a placement rate of 92 percent. In addition to taking the course, students must take EPA tests to be certified as brownfields workers in each specific area. Two of the speakers at the ceremony were from a major employer of brownfields workers and they spoke enthusiastically of the need for workers with the skills offered, and the certifications obtained, by the brownfields training program. The speakers (whose photos appear above left) were Kenneth Lucianin, Commissioner of the Passaic Valley Sewerage Commission, and Michael DeFrancisci, Executive Director of the Commission. They projected that the demand for graduates will grow quickly with Superstorm Sandy's remediation needs, on top of the steady supply of New Jersey Superfund sites that can be developed once they have been appropriately remediated. Schenine Mitchell of EPA Region 2, participated in awarding certificates and spoke to the group glowingly of the brownfields training program. The program combines training in basic education and technical sophistication with an emphasis on strong mutual support among members of each class after they leave the Institute. We don't care a whole lot about what you did and where you came from before you came to us. We care where you are going and how you are going to get there. I suggest that the people who are disappointed with what Brooklyn ex-offenders are getting in the way of training and support go see what the New Newark is delivering. (red squares). 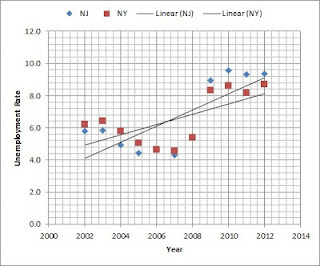 After 2008, NJ rates rose above NY. on 10 months of 2012 data.) Source: BLS. The freezeup of the global financial system, which reached subzero levels in September 2008, affected all Americans. But it affected some more than others. New Jersey seems to have taken a bigger hit than New York State. 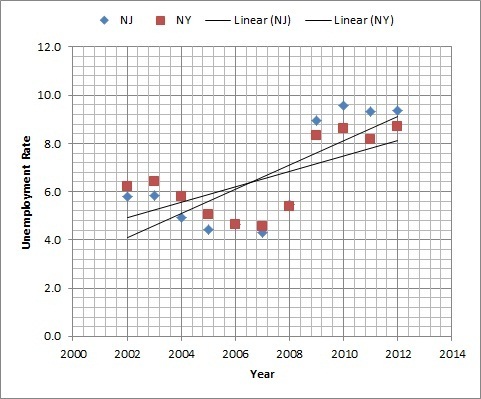 During the go-go years in the mid-2000s, the unemployment rate in New Jersey remained below that of New York State. New Jersey residents who worked in New York City brought their paychecks back to their local communities and supported employment where they lived. In the four years since 2008, the situation reversed itself and the unemployment rate in New Jersey exceeded that of New York State. In both states, the unemployment rate between 2007 and 2009 is striking - from 4-5 percent unemployment to 8-9 percent - a doubling in two years! 1. The law of large(r) numbers - If you record the results (head or tail) for each coin toss, the more the more the number of tosses the closer one gets to the long-run probability of 50 heads for every 100 tosses. (The more you gamble, the more certain it is that the casino will win.) New York has more people and workers than New Jersey, so its unemployment-rate estimate based on a small sample of households will be more stable. Its unemployment rate will over time be less variable than New Jersey's. But the New Jersey unemployment rate is not just more variable - it is consistently lower than New York's before 2008 and higher after 2008. 3. Bergmann's rule, also from the 19th century - The mass of a species tends to be heavier in colder-weather regions, to conserve energy. A penguin is bigger than a humming bird, a polar bear is heavier than tropical bears (the sloth bear, spectacled bear and sun bear), which are not found in cold-climate zones. So the big cities - New York and Philadelphia - may have kept their strength by pulling in workers from back-office and branch posts outside the city. by CityEconomist based on BLS Table A2, December 7, 2012. The overall job numbers this morning, for November, were good. The unemployment rate fell to 7.7 percent from 7.9 percent and jobs increased by 146,000, although some prior figures were adjusted downward. But how broadly in the working population was the improvement felt? Answer: The seasonally adjusted unemployment numbers, for November 2012, show declines from October for both whites and blacks, and in the major categories of the civilian population. The bad news is that the differences are still stark. 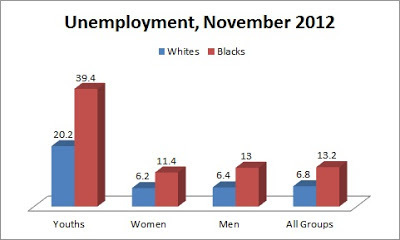 Blacks have an unemployment rate approximately twice as high as whites. The improvement in the black unemployment figures was substantial across the board, between 1.0 and 1.1 percentage points. The improvement in the larger base of adult whites was 0.1 to 0.2 of a percentage point. The rate for white youths fell by 0.4 of a percentage point. President Obama achieved a great deal in his first term to advance energy efficiency and renewable energy. But his objective of making significant progress to slow climate change was not achieved. It was beaten by the fossil-fuel lobby acting through the know-nothing opposition of Tea Party Republicans or their brow-beaten colleagues. With his reelection, in the teeth of huge spending by his opponents, the President is in a good position to get through some of his original program that was left on the table. The lessons of Hurricane Sandy may help his case. 1. Obama put energy efficiency and renewable energy on state agendas. The $90 billion investment in green jobs in the stimulus bill may not immediately have created 5 million new jobs — many states were not ready to take advantage of the programs in a timely way. But it encouraged states and localities to focus on needed environmental initiatives and the longer-term impact of their efforts is real and accounts for about half of the 23 percent lower projections in just a few years of 2020 emissions. 2. His EPA has twice raised auto fuel-efficiency standards under the Clean Air Act. Nixon's Clean Air Act was the basis for the Obama EPA's higher Corporate Average Fuel Economy ("CAFE") standards, first requiring 35.5 mpg fuel efficiency by 2016 and now 54 mpg by 2025. By using existing legislation, Obama moved America forward despite the Congressional stalemate. 3. He regulated carbon emissions under the Clean Air Act. Obama's EPA won a major victory in June 2012 when the U.S. Court of Appeals, DC Circuit, unanimously affirmed EPA's ruling in 2009 that (1) greenhouse-gas emissions pose dangers to public health and welfare and (2) four measures would be instituted to regulate carbon emissions. 4. He saved the U.S. auto industry and its technology-generating capacity. The auto industry bailout was not just a job-creation success. By keeping this major component of U.S. industry alive, the President kept the United States as a strong player in electric-car technology and in the campaign to generate more efficient batteries. 5. He has used federal purchasing power to reduce carbon emissions. He has made energy efficiency part of the mandate and procurement criteria of theGeneral Services Administration and has supported the Energy Star rating program of the EPA and Department of Energy. 6. He has supported four rounds of the ARPA-E program for energy technology research. The Advanced Research Projects Agency, once part of the Department of Defense, has an energy component administered by the Department of Energy. It has so far made awards for 107 project awards, with amounts ranging from $400,000 to $6 million each, for research on such topics as "electrofuels", carbon capture, batteries, electric grid, thermal energy storage, and rare earth substitutes. It would be hard to overestimate the long-term importance of this effort for the United States and for the planet. That Obama didn't succeed in doing more on climate change reflects unpredictable developments. The BP oil spill early in his first term discouraged offshore oil drilling, and the Fukushima nuclear meltdown discouraged further nuclear power development, constraining his options. But most important, the Republican House of Representatives adopted a totally negative stance toward the President's climate-change goals. The entire minority membership of a committee headed by Senator Barbara Boxer's committee boycotted hearings on the House-passed Waxman-Markey cap-and-trade bill. I had a ringside seat to observe the crackup of the legislation in the 111th Congress, as senior economist for Congress's Joint Economic Committee. The bill was debated to death in the Senate. After the election of more Tea Party adherents in 2010, it was all over. In 1970, it would have been hard to believe that 42 years later the nation still would not have such a carbon tax or a carbon-price-setting mechanism like a cap-and-trade system. Green issues then had bipartisan support. President Nixon's strong Clean Air Act amendments to the original 1963 Act created the EPA, William Ruckelshaus became its first head (and the late Russell Train its second), and new water-pollution laws were passed after two years. What stopped progress? OPEC's decision to create an oil shortage. Inflation cascaded through private and public prices and economic concerns overtook environmental ones. The GOP took on the mantle of environmental deregulation in the name of promoting economic growth, although significant instances of environmental progress have occurred under Republican leaders since Nixon. President Reagan, for example, may have cut social and environmental budgets, including one-third of EPA spending, but in his second term he did something important. He noted the high cost of ozone-depleting chlorofluorocarbon (CFC) gases and he promoted a worldwide reduction via the 1987 Montreal Protocol. This Protocol has been described as the most successful international convention ever, signed by 197 countries and the European Union, and it has stopped the growth of the ozone hole although some aerosol substitutes, such as hydrofluorocarbons, continue to contribute to global warming even though they don't damage the ozone layer. President George W. Bush during most of his administration was, like Reagan, antagonistic to environmental regulation, but in the latter years of his presidency he championed significant initiatives to conserve natural resources that became law, and he moved the country along on the path toward greater energy efficiency. Given that Reagan and Bush 43 added valuable environmental achievements late in their second terms, President Obama has some encouraging precedents. The fact that his re-election results are strong may have something to do with Republican leaders entering the 113th Congress with a more serious inclination to cooperate with President Obama than two or four years ago. He now has a real opportunity to achieve more of the change he promised in 2008. Climate-change legislation deserves to be near the top of the President's second-term agenda. Even if the United States magically reduced its emissions to zero, the planet will be threatened by the continuing rapid industrialization of China, India and other emerging economies. For the United States to exercise global leadership on this important topic, it must do more at home. Some things will happen on their own. The Energy Star rating has been shown in several articles by Professor John Quigley and others to raise the value of a property significantly for both sale and rental, so this certification has legs. Venture capitalists are supporting renewable energy projects. Vehicle manufacturers are hard at work on fuel and battery efficiency. HSBC Bank projects the low-carbon economy will triple to $2.2 trillion a year by 2020. 1. A carbon tax. The lack of progress of the Waxman-Markey bill in the Senate despite support of the President's Climate Action Partnership has reopened bipartisan consideration of a direct tax on carbon of perhaps $20 a ton. This might add 10 percent to the cost of gasoline, but it would lead to correct signals being provided throughout the economy. Pigou-type taxes on pollution ("tax bads, not goods") are viewed with a friendly eye by many analysts on both the left and the right. 2. Trading permits — the Cantwell bill. As a backup for a carbon tax or a parallel strategy, the limited cap-and-trade bill proposed by Senator Maria Cantwell (D-WA) is a good plan that could be a focus for bipartisan negotiation. It creates an "upstream" (at the power-generation source) market for carbon among large energy producers and users. It seems to me easier to understand and execute than the broadly based Waxman-Markey bill. 3. Championing state and local initiatives. With Hurricane Sandy as the backdrop, support local environmental investments and rethinking of zoning and building codes or planning for surge protectors. Green incentives in the stimulus bill have encouraged states and localities to act to improve energy efficiency and reduce emissions. Without a carbon tax or a national market for carbon permits, these efforts need encouragement. The President can help revitalize them with national support of subnational and private investments. 4. Using the Presidency to make the case for change. Michael Northrop, program director for sustainability at the Rockefeller Brothers Fund, urges the President to use his second-term status to tell the truth about the U.S. coal industry, its grave impact on climate change, its declining share of electric-power fuel, its declining employment. Coal employs 40 percent fewer Americans than a few years ago as U.S. solar jobs grow 13 percent annually. He recommends the President convene a national bipartisan climate action planning council composed of sitting and former state and local officials, company CEOs and civic leaders, with leadership by a senior advisor in the White House appointed for this task. A good idea. 5. Continued agency actions. Since the Congress is unpredictable, the most reliable way forward is to continue exercising executive authority through the EPA, Department of Energy and other agencies to lower emissions and to build clean-energy markets. The President has already done much by using federal buying power to support clean-energy markets, but he can do more. Catalogs of options include those of the Center for Climate Strategies and the Presidential Climate Action Project. The timing of Hurricane Sandy could not have been better for purposes of bringing more business leaders on the side of action to address climate change. Stay tuned and make your voice heard. Dr. Marlin is Chief Economist for the New Jersey Institute for Social Justice in Newark, NJ. The views expressed in this post are not necessarily those of the Institute. The abopve post appeared on the Sallan Foundation site a few days ago.